Clean Air Compost is a Fort Collins locally owned and operated recycling service (aka Clean Air Recycling & Waste Services) that provides a convenient and comprehensive compost pick-up service to reduce trash volume and help the community divert more waste from the landfill. 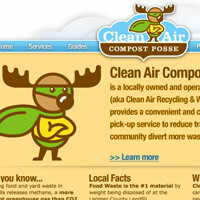 Clean Air Compost needed a clean and engaging web site design and subsequent development. Every Perspective designed the site based on an existing logo that was previously created by a very talented designer. We invite you to check out these environmentally-friendly services: Clean Air Lawn Care and Clean Air Compost. 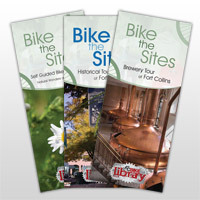 These brochures were created for FC Bikes (Fort Collins Bike Division) and The Fort Collins Bike Library to encourage both visitors and citizens of Fort Collins to utilize bicycles as a great way to tour the sites of the city. 3 brochures were created: A Historical Tour: Showcasing historical houses, buildings and landmarks; An Environmental Tour: Visiting the Natural Wonders of Fort Collins; and the ever-popular Brewery Tour: Visiting some of the best breweries in the world...right here in Fort Collins! All tour brochures can be downloaded on the FC Bike Library website. We're collecting more examples of our work...check back soon!